Rear Admiral Oğuz Karaman, Turkish Navy has relieved Rear Admiral Anho Chung from the Republic of Korea Navy, as Commander Combined Task Force (CCTF) 151 (counter piracy). The change of command ceremony was conducted by Vice Admiral John W. Miller, Commander U.S. Naval Forces Central Command / Commander, U.S. 5th Fleet / Commander, Combined Maritime Forces on board the Republic of Korea Ship (ROKS) Wang Geon, Mina Salman, Bahrain, September 19. (left to right) Outgoing CTF 151 Commander Rear Admiral Anho Chung from the ROKN, CMF Commander Admiral John E. Miller and incoming CTF 151 Commander Rear Admiral Oguz Karaman from the Turkish Navy salute during the playıng of the National anthems as part of the CTF 151 Change of Command ceremony. 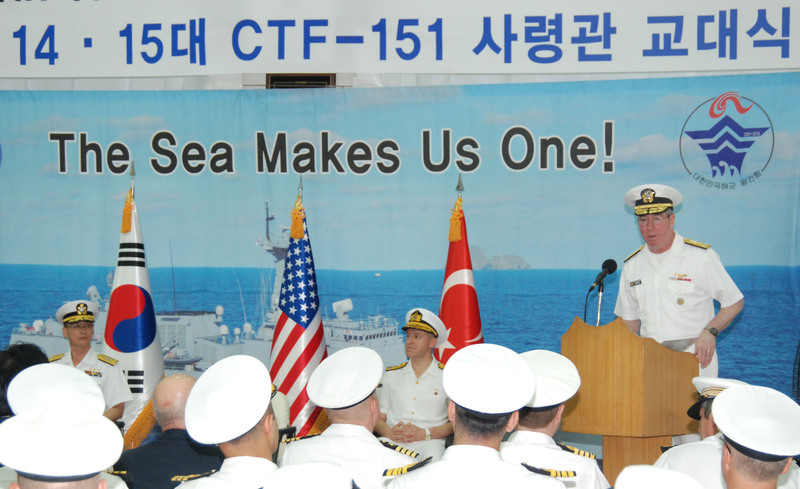 The ceremony concluded the Republic of Korea’s second command of CTF 151, during which the team consisted of one staff member ashore and 21 afloat. The most obvious and immediate success of the Korean-led CTF 151 was the fact that no merchant vessels were pirated during Rear Adm Chung’s command period. During his tenure Rear Adm Chung also served as Somali Basin and Gulf of Aden Coordinator, ensuring that CTF 151, CTF 465 (EUNAVFOR) and CTF 508 (NATO OCEAN SHIELD) maintained a coordinated 24/7 anti-piracy presence throughout the strategically important areas. As CCTF 151, Rear Adm Chung led a staff from eight CMF nations in maintaining excellent coordination with other CTFs (150, 465, 508), leading to an unprecedented two “Big 3” (CMF, EUNAVFOR and NATO) meetings at sea on 30 July 12 and 24 August 12. Additionally, Rear Adm Chung improved upon the already strong partnership with our EU and NATO counterparts through weekly scheduled chats and daily communication at a tactical level. While the deterrence and disruption of piracy operations is the primary CTF 151 mission, Rear Adm Chung also understood the importance of supporting all fellow mariners, and CTF 151’s joint efforts with their CTF 150 counterparts led to a very successful medical evacuation from the MV BELDE on 20 Aug 12. He also excelled at regional engagement with CMF partner nations in both the Middle East and in Africa. 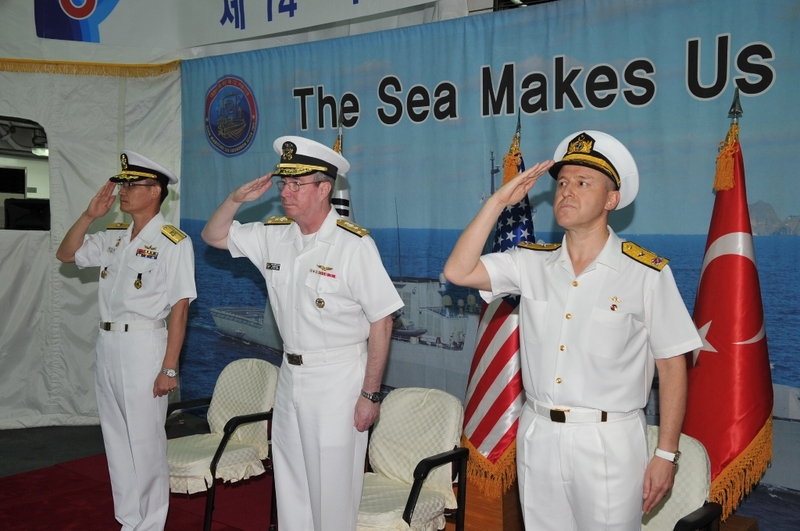 Vice Admiral Miller speaking at the CTF 151 change of command ceremony on board ROKS Wang Geon with Rear Admiral Chung (left seated) and Rear Admiral Karaman (right seated). In recognising Rear Adm Chung’s excellent leadership, Vice Adm Miller commented: “CTF 151 has a difficult counter-piracy mission that is a generational fight and will not be ended by a surrender on a battleship deck. Combating piracy requires patience and persistence. It requires firm leadership and coordination with other Task Forces. It requires nations like the Republic of Korea and Turkey to continue to work together with CMF, NATO, the EU, and others to blunt the scourge of piracy.” Vice Adm Miller congratulated Rear Adm Chung on his outstanding leadership and welcomed Rear Adm Karaman to his new command.